Russian Foreign Minister Sergei Lavrov declared that Russia is not looking to establish additional overseas military bases for the Russian armed forces, despite rumors to the contrary in Vietnam and Cuba. The subject has been top-of-mind since Russian involvement in the Syrian campaign and the newly established Russian facilities inside Syria, as well as the port of Tartus. Venezuela has also been mentioned as a likely spot for the Kremlin to hang its hat, as the oil-rich nation descends into the anarchic pyre of failed socialism, providing opportunity for Moscow. 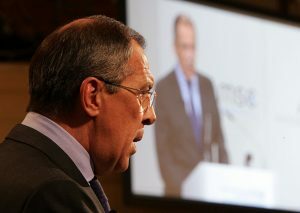 “Unlike a number of other countries, Russia is not seeking military expansion,” Lavrov said in an interview with the state-run Rossiya Segodnya news agency Monday, reported The Moscow Times. Although it is likely Moscow would like to expand its military presence overseas, the simple fact is the Kremlin most likely does not have the money. The Ukrainian and Syrian adventures have been very expensive and have put a strain on the Russian military. Putin must now focus on the 2018 election and the economy.